Just when they started feeling some heat from the Honda CBR250r, Kawasaki has upped their game in the entry level sport bike market with the introduction of the all new Ninja 300. The Ninja 300 has an amazing 20% more HP than its predecessor the Ninja 250. The Ninja 300 is powered by a parallel twin with new digital fuel injection that provides snappy power along with improved fuel economy. The styling of the 300 sets it apart from the competition with an aggressive and edgy look, typical of the Ninja family. The all new F.C.C clutch includes slipper and assist functions. This allows the clutch to handle more power while also making the clutch lever significantly easier to operate. The slipper assist function also reduces rear wheel hopping that could be experienced during heavy downshifting. The following video goes over these features and many more. 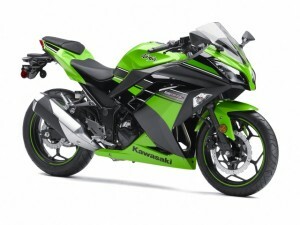 The base version of the Ninja 300 starts at $4,799. There is also an ABS version that retails for $5,499. Both are available for viewing at Contra Costa Powersports. 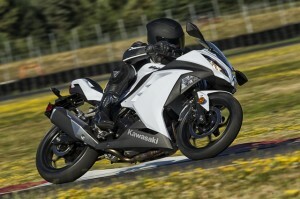 This entry was posted in New Kawasaki Motorcycles on December 23, 2012 by Dave.